The "Hill of Hope", the endpoint of the pair-to-single exam and in my opinion, where the most moving moment in the whole of ARIA took place. However, a detour first. Origination skipped the manga's Navigation 53 but on their coverage of Navigation 51, used one picture seen in 53. 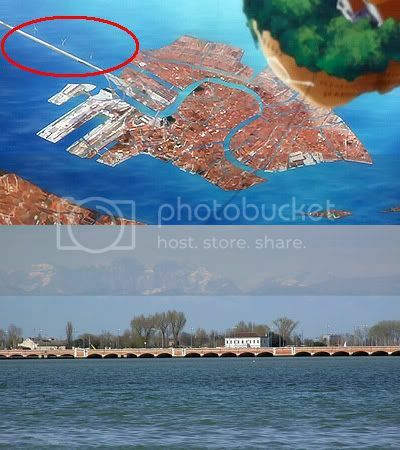 You can see from the red circled parts that a chunk of Venice has been taken out, while the manga kept that chunk accurately (Thanks to Will for spotting this.)! Another error is that, there are seven bridges instead of the real-life four spanning the Grand Canal. The reason for the above detour is I have another use for the same picture. In the real-world Venice, there is a causeway linking the island to the mainland. This causeway is also included in ARIA and is presumably the only way to the hill of hope, which seemingly is on the "mainland". While ARIA boasts an elevated canal causeway with wind turbines, the real-life causeway is a gigantic 4 lanes of road and 4 tracks rail. Let us now familiarise ourselves with the Geography of the Hill of Hope. A green hill overlooking Neo-Venezia. The ever so lovely dekkai-chan included as a bonus. Now I shall have to tell you this location is fiction, because in real life the city of Mestre occupies the spot. To top it off, the city is flat as a pancake! No picture unfortunately as I found Mestre to be fairly "ordinary". "From here a garden scene continues for a while. This differs from the better-known port scene so please enjoy the different face of Neo Venezia"
I took my picture in the open areas of the eastern part of Venice. Although the trees are missing leaves (first week of April, too early), the shape and placement of the trees bear great resemblance to the Origination. The "East End" of Venice is truly a "different face" of Venice. You cannot find such an open space with so much greenery anywhere else. Add to that the lack of lemmings *whoops* tourists excluding myself! Therefore the 5% reality of the Hill of Hope is found here, in the East Castello region. Definately far more worth it for me than a certain graffitied top-heavy bridge full of lemmings! Oh, thanks, I was mentioned again. Wow, I never thought that there's such green place in Venice! Another place I'll visit, when I revisit Venice someday! Hmmm, error, are you sure? Aria takes place in 2301-2303AD and they probably built more bridges in those next three centuries. Remember, Calatrava's bridge was just recently inaugurated in Manhome-Venice, so there is progress already. It would not be honest to expect a perfect Venice replica. Akari clearly says in the neo-Murano glass episode that the terraformers created an artifical city. In ep. 12. (Avvenire) you can see that much of the structure meant to be underwater was made out of ugly concrete blocks. Such material didn't exist when Manhome-Venice was built. Otherwise, I think Neo-Venezia is simply adjacent to Neo-Slovenia on Aqua-Mars. That would explain the hilly landscape very well. Granma definitely lives in Neo-Slovenia. I am pretty sure the Liberty landbridge has tracks even in Aria. In the Galaxy Night Express episode Miss Hahi mentions that regular trains do not run during the night - so they run during the day. Also, the girls went to see Granma onboard an automatic streetcar during the first season. The part they took out is the Arsenale, an active military base in real life Venice. I saw an italian missile frigate there circa 2001. 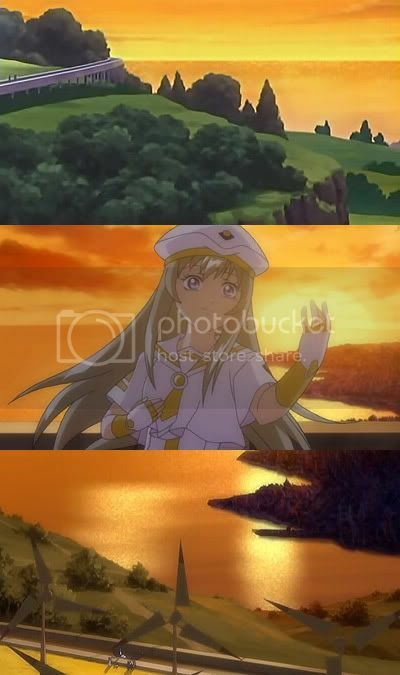 Since there is no war on Aqua, no armed forces, not even policemen as far as the "Ai-chan kidnapped" manga special suggests, why would the terraformers need to build a naval base for Neo-Venezia? The omission could be a mistake of J. Sato's staff or it could be intentional. It looks like ARIA's Hill of Hope is not modelled after anything in Venice, Italy. One of the likely candidates is the so called Venice of the North: Saint Petersburg city in Russia. The area of Duderhof Hills is similar to the Hill of Hope scene, although without the wind turbines. The exaggerated width of some canals in AQUA/ARIA also feels like out-of-venetian experience. On the other hand, the canals and circa 350 bridges of St. Petersburg are much wider compared to venetian standards. While you have a valid point about the 7 bridges, it poses one problem. It makes the Traghettos obsolete! I am very much aware about obvious differences in Venice versus NV - Orange Planet, Aria Company being the most obvious ones! As for the concrete blocks, you mean the canal for the water supply? Concrete does make sense though, because the present Venice suffers from its wooden foundations rotting away. I do believe that causeway in Aria is a canal-rail bridge as well, after "Santa Lucia Station" was mentioned in Origination ep12. Your paralells with St. Petersbourg is rather interesting. As for the part they took out, it's not only the Arsenale - but the whole of East Castello which featured in Origination ep5.5! 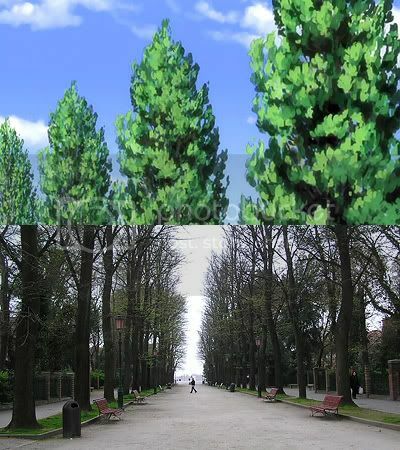 The Arsenale exists both in the manga/anime however.